SoftPlanet makes it possible for everyone to get free NANO AntiVirus download directly from our servers. There is no registration needed for downloading. NANO Antivirus provides reliable protection for your computer from any kinds of malware. It is 100% free, but in the meantime it is fully featured and powerful. It uses cutting edge technology for assure your high performance and fast workflow. NANO Anti-virus comes with different type of interfaces, designed for various users. Detection of new types of malware through system behavior analysis. 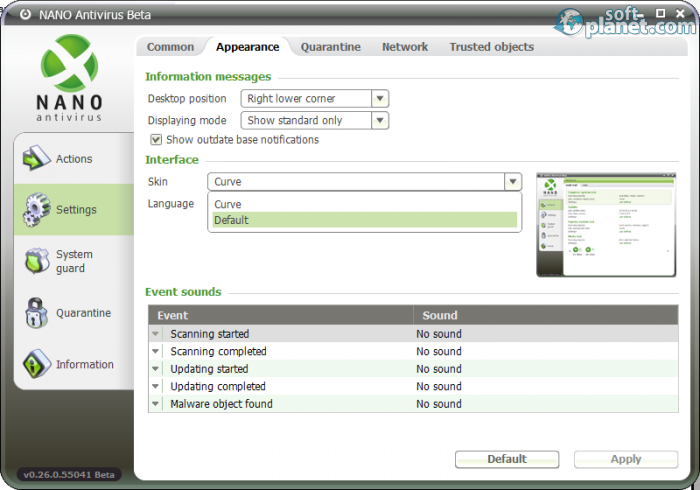 NANO Anti-virus might be a free protection software application, but it is very powerful, reliable and efficient. It assures you real time protection from viruses, trojans and worms. Unlike other anti-virus software, it really supports high speed scanning. NANO Anti-virus automatically updates its virus database. The main feature of NANO Antivirus is the possibility to choose a handy interface with the required functionality. There are light interfaces with optimal settings, which are designed for users, who don't need additional settings. There also are more complex interfaces, which gives possibilities for tweaking. They are aimed at advanced users and IT specialists. It also has two skins available – a standard and a curvy one. Due to its user-friendly and intuitive interface, NANO Anti-virus is very easy to work with. Navigating through the menus is like a child's play and it is a click away from you. You are able to perform high speed and in-depth scan within a second, depending on your specs. NANO Anti-virus is designed for various users - from novices to experts. You can customize it in the most convenient way for you. NANO Anti-virus is free protection software for your Windows version, which will stop most of the known viruses, Trojans, worms, etc. It also assures real-time protection for your system. I really recommend it, however my advice is to uninstall your current anti-virus program in order to prevent any trouble. Our security scan shows that NANO AntiVirus is clean from viruses. The current version of NANO AntiVirus has been scanned by our system, which contains 46 different anti-virus algorithms. That ensures that NANO AntiVirus 0.30.16.66646 is 100% safe for your computer.